GREEN BAY, WI – JANUARY 08: Odell Beckham Jr.
Giants fans and football fans alike got a little treat Monday morning as Odell Beckham Jr. showed off his skills at training camp. It’s unreal to see an athlete like Beckham make that play look so easy even if it’s just against a teammate at camp. He still has to get to the football at its high point and still has to catch it one-handed. Oh, and he catches it back-handed on top of that! Giants fans have to be excited to see Beckham this upcoming season. 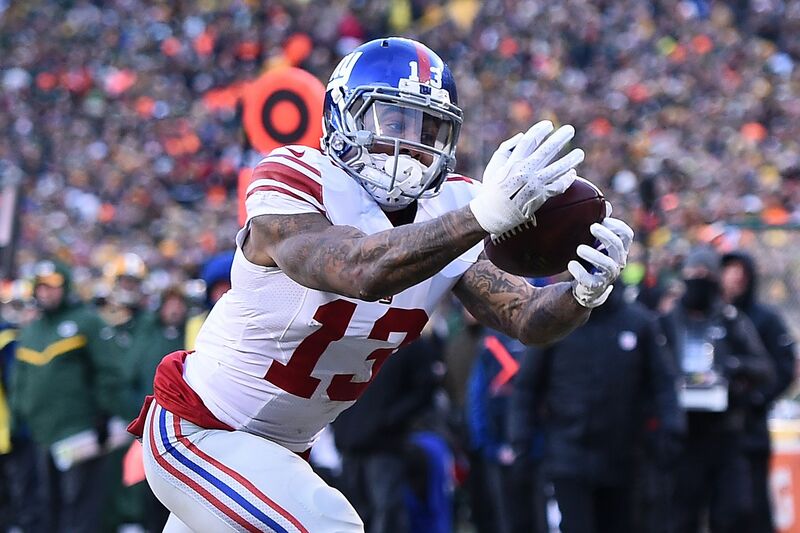 New York added WR Brandon Marshall in free agency, then drafted TE Evan Engram in hopes of making the offense more dynamic around Beckham. WR Sterling Shepard could take a step forward in his second season as well. In just three seasons, Beckham has racked up 288 receptions, 4,122 yards, and an absurd 35 touchdowns. He’s one of the most physically gifted players in the NFL and is just entering what should be his prime. He won’t turn 25 until November of this season. Yet another one-handed catch shouldn’t come as a surprise from Beckham. He’s already the author of one of the more famous regular season catches in NFL history. Beckham recently made some small waves when he publicly claimed he wanted to be the highest paid player in the NFL. That most likely will not happen. It’s hard to see a non-quarterback player getting paid more than some of the elite quarterbacks in the NFL.